"Have I gone mad?" "I'm afraid so. You're entirely bonkers. But I'll tell you a secret. 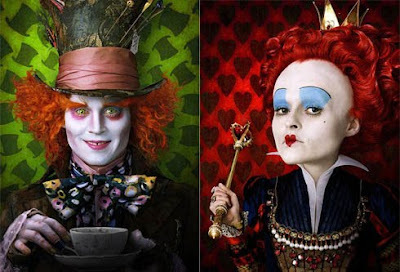 All the best people are.."
Tim Burton films create two camps; the 'Do's' and the 'Don'ts'. The Don'ts don't like the pop-gothic colours Tim paints his films in, they don't like the fact he pretty much hogs Johnny Depp, and they don't like it when the world doesn't listen to the voice of the Don'ts, especially when the films the Don'ts don't like most, go on to become household names - even Hollywood staples. 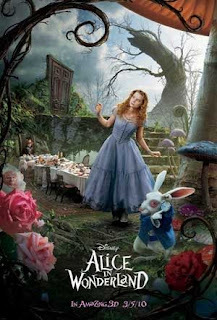 Needless to say, the Don'ts don't need to read this or any other review to know they already don't like Tim Burton's latest pop-gothic painted, Johnny Depp starring blockbuster; Alice In Wonderland. They just don't. The Do's on the other hand do like Alice in Wonderland. In fact they like it so much, they look back and wonder if they ranked Avatar a little too highly, because it was the first to do the new 3D, yet the repainted 'wonderland' puts that experience to much better use. The Do's are also glad that Johnny Depp does what he does best, but they do willingly admit he's a bit more subdued. This gives room to other repeat 'doers'; Danny Elfman (who amazingly did the theme to greenscreen footage alone) and Burton's partner, Helena Bonham Carter, who makes for a wickedly fantastic 'Red Queen'. For you the plot of this sequel of sorts, is of a girl named Alice, trapped in high society and been told what to do and what don't. Yet in Wonderland discovers, that the affirmation of 'doing' is something that's best left to - and decided by - you. If you're on the fence as to whether you are a 'Do' or a 'Don't', this film will certainly make you decide. Being a dude myself who doesn't agree with the Don'ts and therefore a certified 'Do', I'm glad Lewis Carroll's original has finally been respectfully explored, as only an imaginative thinker like Tim Burton could do. I totally agree with you, this is very much a fun film and worth the price of a ticket! great review. I wrote one too, check it out on my blog. Thanks Jimmy - glad you like the review!